The cartridge concept allows fuel cell plant designers the maximum flexibility for piping arrangements. By designing a custom manifold, you can connect to the Humidicore™ cartridge as you please. 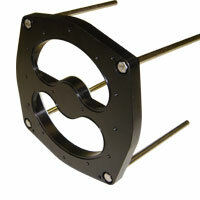 However, Emprise offers a line of standard manifolds that also offers some flexibility. Figure 4-1 illustrates the basic manifold blank. Starting from this blank, we can cut nozzle openings in several ways as shown in Figure 4-2. Basically, the nozzles can penetrate the manifold blank from the top or sides or some combination of orientations. The nozzle port is usually a standard NPT size but other fittings are possible within the geometry of the blank. The manifold blanks may be made from hard anodized aluminum, type 316 stainless steel or various plastics such as Celcon. As you consider manifold designs, remember that most of the Humidicore™ pressure loss comes from the nozzle dump loss. It is a good idea to keep manifold flow velocities low. Smooth, well distributed flow at the core face minimizes pressure drop and improves Humidicore™ performance.